I am pretty sure that I have been surrounded by forms of satire my whole life. I come from a family who’s always engaging in some sort of dry humor and smart remarks. We all have a strong sense of sarcasm, and often use it when we are implying the exact opposite. It’s something I grew up around, and it clearly shines through in my personality. I would google types of humor, but my WiFi is being so incredibly slow that it took my add new post page ten minutes to load, so I’m not even gonna try to load another site. I pick on people a lot, but I’m the person who only picks on people who I like…I don’t target people I don’t know or am not close friends with to make jokes about or pick at. My closest friends get picked on the most, and if I make smart remarks towards you or am sarcastic about your remarks, chances are, I can deal with your company or maybe I even enjoy it. It seems that Mark Twain, whose real name is Samuel Langhorne Clemens, tells of his childhood through the settings of his work. He often sets his stories in places that resemble is hometown of Hannibal, Missouri. His fictional river towns are pretty from the outside looking in, but the reality deep inside is full of drunks, loneliness, cruelty and poverty. Sam experienced a lot of death as a child, watching a local murder a cattle rancher, and a slave dying after being beat with iron. I think that is what I find most interesting. Mark Twain was trying to draw attention to the what seemed to be hopeless lives of misfortune that were being lived. I am so extremely frustrated with this film. I am half convinced that Madeleine is lucid enough to mess with Johns mind. There is no way someone could be so manipulative without knowing. Not to mention, she has to have realized that John is follows her. Maybe she thinks that his stalking is more out of a love struck interest. NOT TO MENTION, John is such a terrible stalker. However, i found faith in him when he played the “i’ll just go with you” card… that was a smooth move executed by not-so-slick john/scottie. At this point in the film, I feel that johns fear of heights has taken a mild pause. It hasn’t been very relevant in the plot recently. Not since he looked out the hotel window, in fact. I’ll give the film some credit, though. I was fairly emotionally involved by the time the period ended last week. Our notes on the film are pretty humorous, all while being accurate, and I think that analyzing and taking notes as we watched is an explanation to why i was getting so involved. My attention was entirely on this film by the time that Midge painted herself as the woman in the painting. I was irritated about how John didn’t even stay behind long enough to act like he had no clue what Midge was referencing. I was ready for a show…or ready for Midge to completely tear John apart. 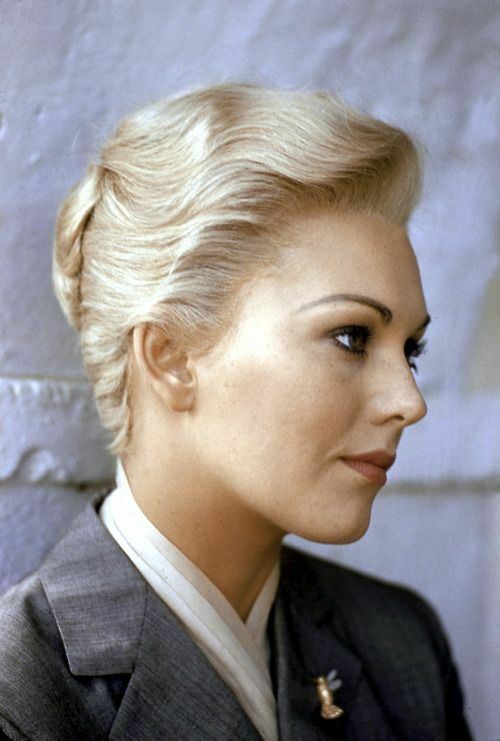 The other thing i noticed is that Kim Novak (Madeline) was quite beautiful in her youth. I’m sure that everyone on set probably fell in love with her at first sight. I am very curious to see what else happens in Vertigo, because if I am emotionally involved now, what’s it gonna come to as this twisted love story progresses? After listening to each of the groups analyze their designated sections in front of the class, as well as answer specific questions that were asked, I was benefited with a much better understanding of what this piece is really all about. I am extremely grateful that we were only given fractions of the entire piece to tear apart and understand, because even with less material included, it is still significantly challenging. I think that each of the groups did outstanding work to help the rest of the class understand the meaning behind their assigned sections. I think that the presentation on sections 4 and 9 was the most appealing to me. It really focused on being your own person and to believe in your own desired values. These sections explain that you are the person who chooses how your life goes. Whitman says that sometimes we need to sit out of the fight because we make the same mistakes over and over. This particular section of the work actually gives me a push of motivation. It irritates me that he wants us to give up and not fight through to find the answers to the same old problems that reoccur. He also points out that people live through unimaginable circumstances and it makes others wonder how it’s possible. In other words, he says that uncertainty is life’s biggest obstacle. “Song of Myself” relates to today’s society because there is so much pressure on young adults and even middle aged people on deciding how they want to live the rest of their lives. Students are questioned in as early as elementary school of what they want to do for the rest of their lives. The questions becomes more and more realistic as middle school rolls around, and most accurately- high school. This work explains that decisions made now can affect us for the rest of our lives, which is what we are told time and time again. What questions/thoughts/concerns do you still have about the work? How would you rate this poem? There are parts here and there that I feel weren’t elaborate enough throughout presentations. It was difficult to take notes while listening to and considering the discussion of each line. I would now rate this poem at around a three out of five, only because its schoolwork, which makes it unwanted to begin with, and it is difficult to interpret without the help of someone who does understand.